Over fourteen years ago I created In Your Business Professional Organizing Services. Like many of you, I am a small business owner with the goal of maintaining a successful business. Through the years, so much has changed the way we manage our time, store our files, communicate with others and operate our businesses. One thing remains constant — my passion to help you grow your potential, operate efficiently and be more productive. Getting "In Your Business" allows me to give you the tools to successfully manage your people, processes, time and stuff. Our goal is to give you the tools to manage efficiently all aspects of your working and professional life. 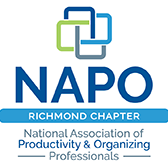 As professional organizers and productivity consultants, we provide easy-to-implement solutions that lead to immediate results, as well as recommend more comprehensive steps toward achieving your desired outcomes. Our promise is to offer the services, support and direction that you and your business need to maintain and continually grow your operational efficiency. We help solopreneurs, small businesses, nonprofit organizations and retailers grow their potential, operate efficiently and be more successful. 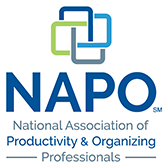 Let us team up with you and share our organizing and productivity expertise across industry lines with you. Separate your personal life from your professional life; this means having separate spaces, filing systems, phone lines and e-mail addresses!